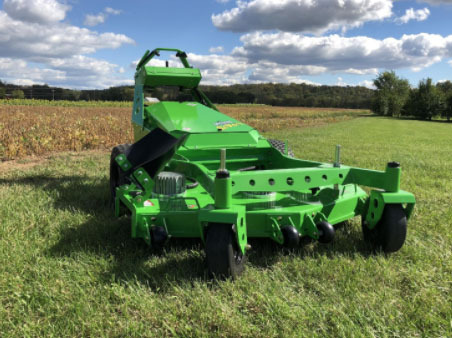 The Revolt is the latest release from Mean Green Mowers. This machine is a real slope hugger. The machine has a low-slung, super-wide stance, and the batteries hover in a low position to create a really versatile low centre of gravity. There’s few worries from loss of control and absolutely no issues with fuel starvation common to internal combustion engines. You have the option of one or two batteries depending on your requirements for mowing time, and the option of a 48 inch or 52 inch deck. The larger deck is loaded with higher-powered electric motors to get you effortlessly through the day. And, common to all Mean Green Mowers, don’t forget you’ll have a happy community with a top noise level of only 78 dB.